The Village of Coal Valley is located in Henry and Rock Island Counties, Illinois. The Village is a residential community and is a suburb of the greater Quad Cities area. Find out the history of the village. 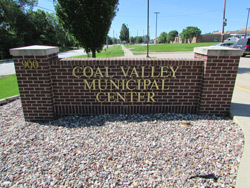 04/19/2019 - The Village of Coal Valley us now accepting bids for one Kohler generator for our 1st Street sanitary lift station. Click here for bid specifications and requirements. Bids will be accepted until Friday, April 26 at noon. Any questions please call the Village Administrator, 309-799-3604, ext. 206 or Public Works Superintendent at 309-799-3604, ext. 205. 04/11/2019 - It is that time of the year again when the weather starts getting nice and everyone wants to get outside and start enjoying the fun times. Please remember to honor private properties here in the Valley, especially the ponds and the timbers that are marked by the owner's to stay off the properties. These owners' have the right to post "NO TRESPASSING" as they have to deal with the liability if someone is hurt hiking, swimming or fishing. Many people enjoy mushroom hunting or mountain bike trail riding in the timbers/woods but still have to abide by the law. Parents are responsible for their children's actions so educate them on the courtesy of private property. 03/12/2019 - 2019 Annual Coal Valley Garage/Yard Sales and Clean Up Days: Please click the links CV Garage/Yard Sales or CV Clean Up Days for information regarding dates and times of these events. 03/08/2019 - The National Weather Service 2019 Spring Flood Outlook. Click here for the report. 02/22/2019 - The Village of Coal Valley is currently accepting applications for a part time Summer Park Program Director for the 2019 season. The program runs for 8 weeks, Monday, Wednesday & Friday 9am – noon, starting on Monday June 10th until Friday August 2nd, 2019. Under the supervision of the Village Administrator and Director of Finance, the employee will plan daily activities, order supplies & supervise other staff for the Park Program. The position pay is $20.00 per hour with no benefits. An application may be picked up at the Village Hall, 900 1st Street or click here. Applications will be taken through Friday, April 26th, 2019. 1/18/2018 - Please take a moment to complete this survey. The information will be provided to interested grocery stores. 01/11/2018 – The Village of Coal Valley is actively pursuing a grocery store! Many of you may have seen the Mayor’s interview on KWQC last night at 10 pm and then again over the noon hour today. We want to keep the positive momentum going so please visit the Mayor’s or the villages Facebook page to show your support! Remember, there is strength in numbers! 01/05/2018 - Mayor Bartels is looking at placing some historic signs in our downtown "Post Office" park square and would like your feedback. Here are three examples of the signs that we hope to install in the "Old Town" / "Village Green". Which sign / name do you prefer? One interesting and important note is that the current subdivision name for this area is in fact "Old Town". We could also go with the option of not assigning a specific name to that area? Also "Old Downtown" was considered but we could not make it aesthetically appealing. In order to complete this project we need donations to pay for the signs. We are hoping to purchase 10-12 signs. Cost to make each sign is around $100. The signs show the current street name and the original street name below. If you live in this area your current address will not change. If you would like to make a donation to make this project a reality please donate at Village Hall or our GOFUNDME.com campaign.